Buying, selling, budgeting, and saving are fundamental business practices that almost everyone understands on a basic level. From them, more complex transactions are derived, and these constitute a realm of business that few people find easily accessible. 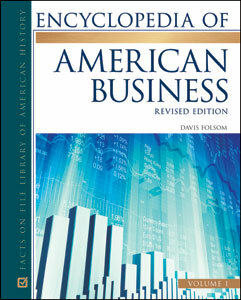 Featuring more than 800 entries, the two-volume Encyclopedia of American Business, Revised Edition is an up-to-date, easy-to-use guide to the nuts and bolts of business jargon. Difficult ideas are explained in straightforward language to help nonspecialists, students, and general readers understand the complex and sometimes confusing concepts and terms that are used in business. Five general areas of business are covered: accounting, banking, finance, marketing, and management. This encyclopedia focuses on the terms, concepts, and associations that one is most likely to encounter in business, making it a great place to start learning about how businesses operate and what the primary and different features of specific business-related functions or ideas mean. Troubled Assets Relief Program (TARP).